You’ve heard the message: CMA certification, “You’ve got to earn it!” We say this because the CMA® (Certified Management Accountant) exam is rigorous, requiring mastery of many skills and many hours of preparation to pass. Yet rigor of the exam alone isn’t what makes the CMA the leading management accounting certification and a mark of excellence in the profession. Relevance is also critical. Passing the CMA exam demonstrates your command of the most vital accounting and financial management skills, including financial planning, analysis, control, decision support, and professional ethics. But times change, and the CMA exam also must change to maintain its relevance. ICMA® (Institute of Certified Management Accountants) is dedicated to ensuring the CMA exam stays relevant in this constantly changing environment, which means identifying the skills management accounting and finance professionals need now and in the future. What are those skills? Those in the management accounting profession answered that question through a job analysis survey. As part of ICMA’s continuous journey to maintain the excellence of the CMA exam, the ICMA Board of Regents and ICMA staff review the CMA exam content on a regular basis to ensure that it covers the subject matter most relevant to practice. To accomplish this, ICMA follows the best practice for professional certification programs of conducting a job analysis study every five to seven years. Such a survey is a precondition for a valid and high-quality exam, so ICMA conducted the latest job analysis study in the first half of 2018. The purpose of this study was to confirm that the CMA exam continues to test the knowledge and skills that are most important for management accounting and finance professionals. We began this project in February 2018. 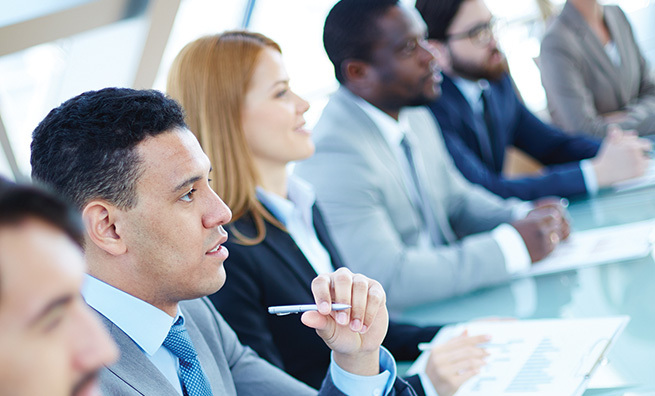 Working with a professional testing facilitator, the Board of Regents and ICMA staff created a detailed questionnaire that covered the knowledge required of management accountants on the job. A pilot test of the survey was conducted, and revisions were made. The final version of the survey was sent to IMA members and other practicing professionals in April 2018. This job analysis questionnaire was a detailed one-hour survey that asked specific questions about the respondents’ tasks on the job and the knowledge they need to perform those tasks effectively. The results of this study will be reflected in the CMA exam beginning in January 2020. We had more than 2,000 usable responses to the survey, representing professionals from companies of all sizes all over the world and representative of our global profession. 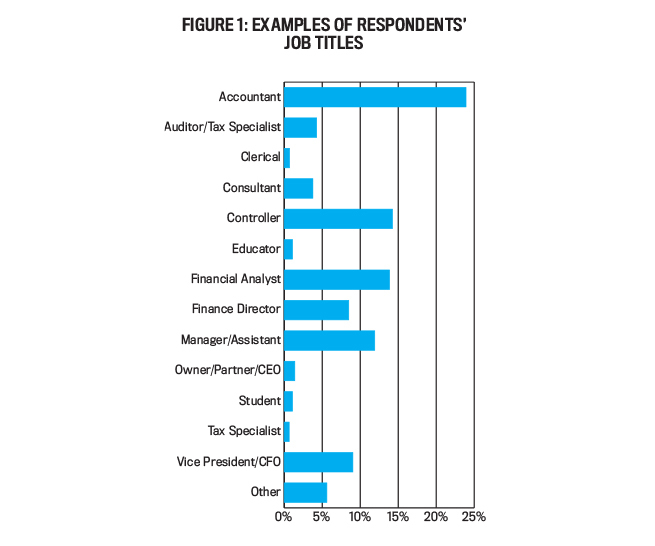 Figure 1 is a snapshot of the job titles for the respondents. The survey results provided a foundation of empirically derived information from which to develop the Content Specification Outlines. They showed that the exam content coverage is comprehensive and covers the necessary knowledge, but it did point to one area where we need more coverage: technology and data analytics. 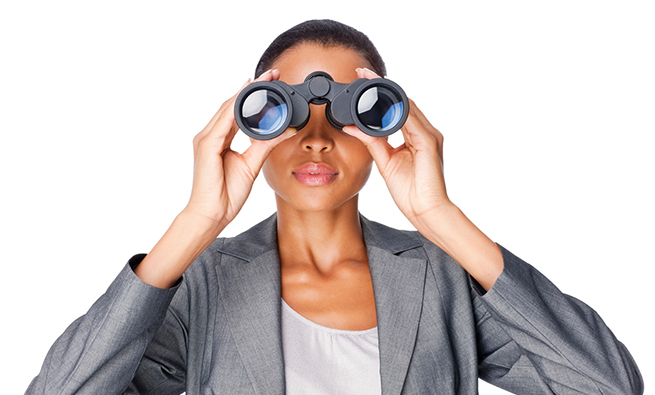 Descriptive and diagnostic analytics is currently covered in multiple sections of the exam, and predictive analytics is covered in the forecasting section. The job analysis results told us that, given the changing nature of the profession, the exam should cover data analytics in more depth and also cover the digitization of the finance value chain. 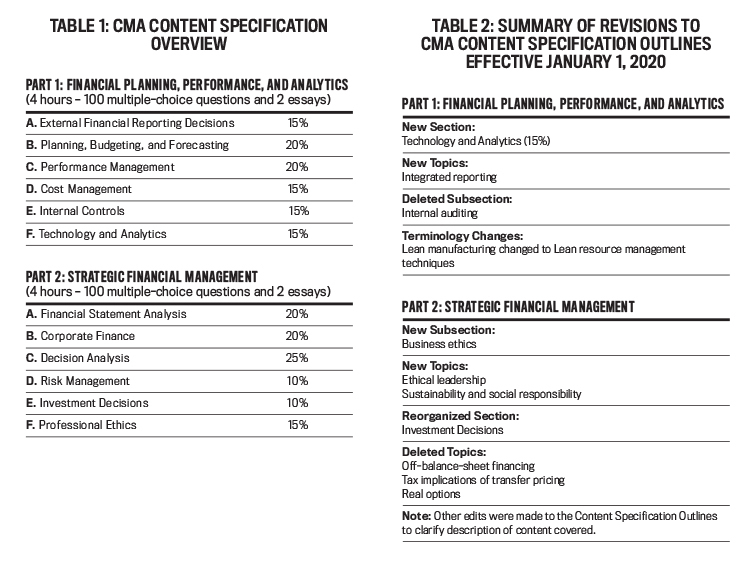 The Board of Regents approved revised CMA Content Specification Outlines that will help make the exam even more relevant for our key stakeholders and ensure that the CMA certification will remain the preeminent management accounting certification in the world. 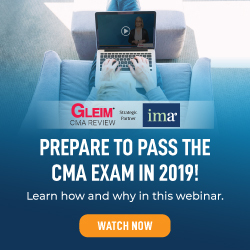 The CMA exam will still be a rigorous two-part exam. Each part will remain a four-hour test with 100 multiple-choice questions and two essay questions. But, based on the survey recommendations, the exam content related to the current impact of technology on the profession will be increased. This is significant. The revised Part 1 of the CMA exam will contain a new section called Technology and Analytics that will be 15% of the Part 1 exam content. This section will test information systems, data governance, technology-enabled finance transformation, and data analytics. To accommodate the additional material, the content coverage percentage for the Planning, Budgeting, and Forecasting section will be decreased to 20%, and the content coverage percentage for Cost Management will be decreased to 15%. 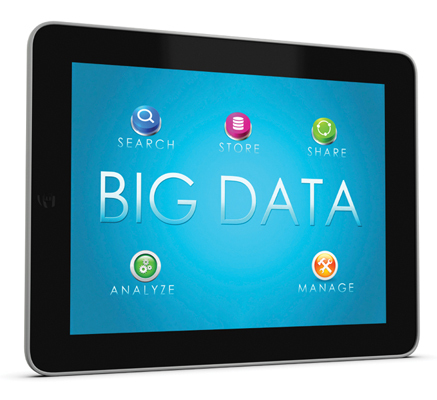 The new title for Part 1 is Financial Planning, Performance, and Analytics. The revised Part 2 of the exam will include greater emphasis on ethics and strategic decision making, increasing the Professional Ethics section to 15% and the Decision Analysis section to 25%. Financial Statement Analysis content coverage will be decreased to 20% and Investment Decisions to 10%. The revised title for Part 2 is Strategic Financial Management. The Content Specification Outlines and accompanying Learning Outcome Statements for this revision can be found on the IMA® (Institute of Management Accountants) website in the CMA section. We will start offering this revised exam in January 2020. We already communicated these changes to the CMA exam review course publishers so they could begin updating their review material. The CMA program has been a model for quality and integrity for more than 45 years, and the revisions to the CMA exam are an integral part of our continuous journey to deliver excellence and maintain relevance. We believe competence can be demonstrated only through a rigorous examination, and the CMA exam remains exactly that. The CMA program has experienced dramatic worldwide growth over the last 10 years in terms of new candidates and new CMAs, and we expect that growth to continue as the CMA certification increases in brand recognition and perceived value. Artificial intelligence (AI) and robotic process automation (RPA) are just two advancements having a tremendous impact on both blue-collar and white-collar workers. Those in the management accounting profession aren’t immune to the threats. 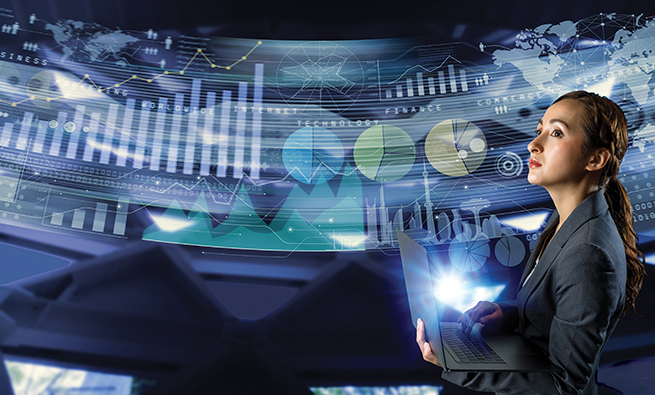 There can be no doubt that some job functions performed by management accounting and finance professionals will become completely automated, but new functions will emerge. It’s time to get ready for the future. 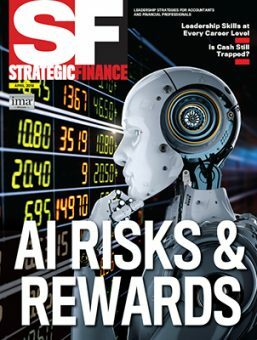 Artificial intelligence—or “augmented intelligence—is here to stay. Anticipating and adapting to change as well as absorbing continuous learning are imperative in an increasingly complex and constantly changing business environment. Both companies and individual management accountants need to raise their level of competence and develop new skills. What is the last testing window when I can take the current exam content? For the English language exam, September/October 2019. For the Chinese language exam, November 9, 2019. When will the updated exam be offered? Starting January 1, 2020, for the English language exam. Starting April 2020 for the Chinese language exam. When can I purchase an exam registration for the updated CMA examinations? For the English language exam, any time after February 16, 2019. For the Chinese language exam, any time after November 11, 2019. Will the exams be offered during specific testing windows? 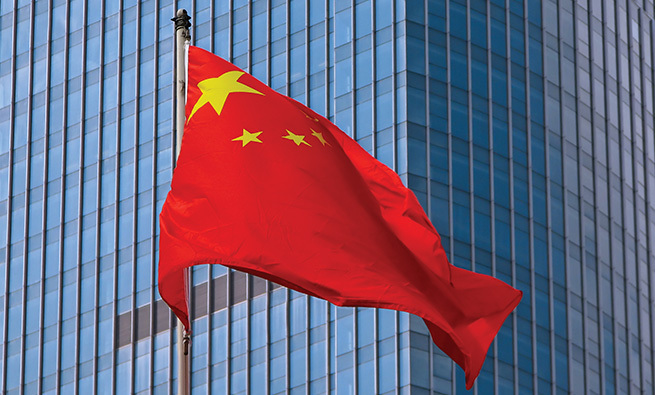 For the Chinese language exam, both Parts 1 and 2 will be offered in April, July, and November. Where can I find more detailed information about the content of the revised exam parts? The revised Content Specification Outlines for CMA and relevant Learning Outcome Statements are available for review at www.imanet.org/2020exam. How long will I have to complete the updated CMA program? Candidates must complete the CMA program within three years from the date they purchase the CMA Entrance Fee. If you don’t successfully complete both parts of the exam within three years of entering the certification program, the passed part will expire. Are there study materials available for the updated CMA exams? Yes. Review course providers, who have traditionally provided study materials for our certification programs, will develop new materials to reflect the updated exam content. Please contact review course providers directly if you have any other questions. For a list of providers, visit www.imanet.org/courseproviders. Is the Exam Support Package available for the updated CMA exams? The CMA Exam Support Package is being revised to reflect the updated content. A communication will be sent once the revised CMA Exam Support Package is available. Do I get credit for parts I previously passed? Yes, as long as your entrance fee is still valid. If I don’t finish both exam parts under the current program by December 31, 2019, do I have to retake Part 1 or Part 2 under the new program? If I don’t finish both exam parts under the current program by December 31, 2019, do I have to repay the CMA entrance fee? If there are any other questions, please contact IMA Customer Service at (800) 638-4427 or +1-201-573-9000 or by email at ima@imanet.org. Paul E. Juras, CMA, CPA, Ph.D., is the chair of the ICMA Board of Regents and is the Vander Wolk Professor of Management Accounting and Operational Performance at Babson College in Boston, Mass. He is also a member of IMA’s Charlotte Chapter. You can reach Paul at pjuras@babson.edu. The IMA, of all organizations, should offer the job title “MANAGEMENT ACCOUNTANT” in job title selection listings.